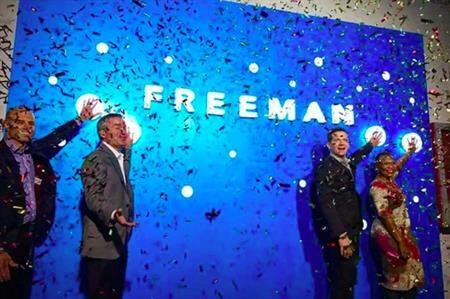 Freeman has launched its agency brand FreemanXP in China and Singapore. The move comes after Freeman acquired Staging Connections Group Limited in November 2015. The event services company, which has offices in Australia, New Zealand and Fiji, operated in Singapore as The Event Company and in China as ETGSC. Both have now been officially rebranded under the FreemanXP umbrella. Commenting on the news Kim Myhre, SVP and managing director at FreemanXP in EMEA, said: "It’s an exciting time for FreemanXP, as the agency now expands its reach into the thriving APAC market whilst our EMEA business continues to grow. "We’ve gone from a start-up business in 2014 to a leading agency, and we continue to grow as our clients embrace the benefits of intersectional design thinking to create breakthrough brand experiences." Dan Hoffend, president of FreemanXP, added: "Today’s integration announcement better aligns our teams to address the needs of clients by combining the Freeman agency resources with ETGSC and The Event Company. "Over the last year, we have continued to invest in our agency business with superior talent, building on the strong reputation and unmatched heritage of the teams. We are excited to create local expertise backed by global resources as we integrate our operations across Asia Pacific and around the world, providing our clients with access to the best minds from Freeman’s global agency."